expressions and postures? Moreso, if YOU are the parent! huge transformation that your life has just witnessed. 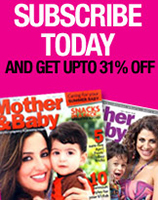 Well, sit back and relax as we guide you through the first few weeks of your unimaginable journey to motherhood. 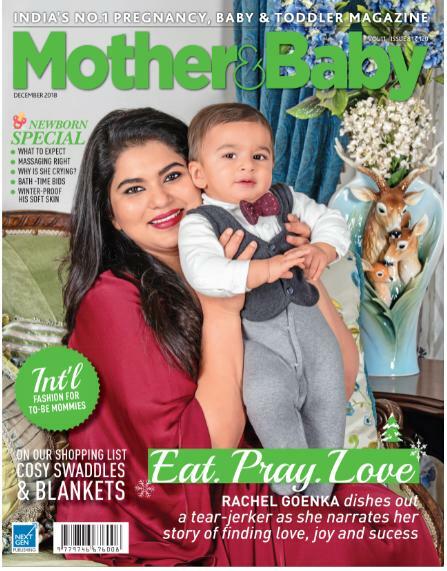 From what to expect from your new baby to a step-by-step guide to care for him, you’ll find everything in the pages of our newborn special. Decoding his crying, giving him a massage or a bath, buying him the perfect blankie, and picking out the best swaddles and wraps… if that won’t have you covered, what else will? 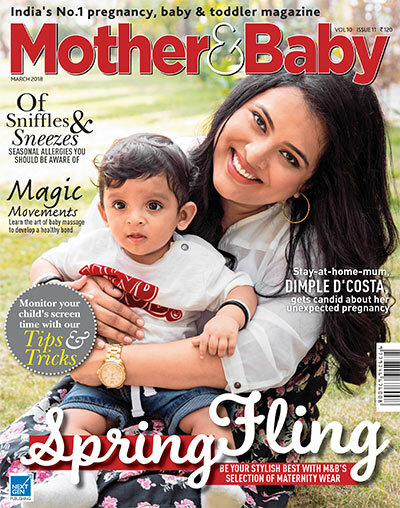 Welcome to our April issue. The weather is heating up and school’s out… well, almost! Naturally, this means big plans are underway for that much-needed summer getaway. And while it’s amazing to make an international trip, India has some gems to offer. Believe me, from sandy beaches, snow-capped mountains to the velvety green cover of tea plantations or the dense forests of national parks, our homeland has some exquisite destinations that make for the perfect place to enjoy a holiday. Choose from one of our top picks! Of course, packing for a vacation means choosing the right gear for where you’re headed. Our pics of stylish summer accessories are sure to help your kids make a fashion statement. Now, while they look and feel good, what you feed them will also impact how energetic they are this season. We have the perfect quick-fix recipes for an interesting summer-friendly menu. Apart from M&B’s suggesions on an ideal way to enjoy your summer, we also have articles on how you can strengthen your bond with not only your kids, but your partner too! Moreover, if you and your partner are looking to add a new member to your family, prepping your body for the journey is vital. Don’t worry, we’ll tell you how. We do hope that you enjoy our Summer Special, and as always, we’ll see you next time! Welcome to the season of new beginnings. You can’t deny that you wake up each morning with that undeniable freshness in every breath and a certain joie de vivre. Now while this season conjures up images of lavendar fields or hillside adventures, the season of spring also brings with it those unwanted colds, sniffles and unavoidable allergies. And while we don’t recommend depriving your children of that much-needed outdoor fun, we will suggest you take the necessary precautions to make sure they stay healthy during allergy season. 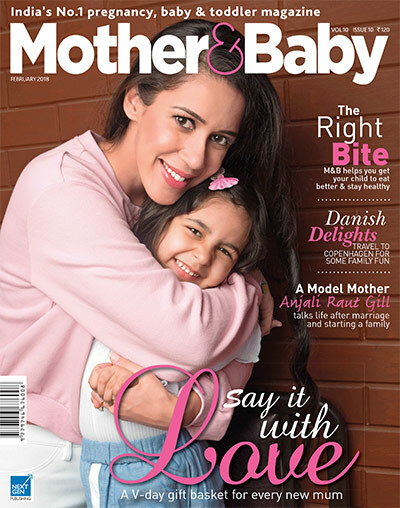 Read all about what to expect in our Cover Plus this issue. But we don’t only have you worrying about your child’s health and the environment. We also raise the question: how much is too much when it comes to screen time? Our article on how you can discern what makes healthy TV viewing for your toddler, is quite enlightening, and a must-read, in our opinion. And with setting rules does indeed come with flaring tempers and tantrums. We’ve got you covered on that too in our guide to the art of patience. But, we do also have some fun in store for you, particularly when it comes to dressing up for the season and showing off your baby bump. Our collection of spring-summer maternity wardrobe is definitely going to make you want to hit those shopping malls! The season of love is upon us. There’s no doubt that Valentine’s Day conjures up images of romantic candlelit dinners, weekend getaways or countless ways to pamper loved ones. But, why wait for one designated day to do so? We believe that the expression of love should be made a year-round affair, but given that it does make one feel extra special every February 14th, going that extra mile won’t do you any harm. Now, seeing that your spouse has given you the biggest gift of love you’ll ever get—your beautiful baby—we’ve decided to help out new fathers, first-time or seasoned, express their love in a rather special way. We’ve curated a ‘Basket of Love’, with much-needed products every new mum will need. Read all about our Cover Plus on page number 56. And while Valentine’s Day is something that most people will focus on, let’s not forget that February 4th marks World Cancer Day, and our story on the effects of talcum powder on page 28, is a must-read. But on a lighter note, your pregnancy should be an enjoyable time. A time to eat well, relax and make the most of your journey before the baby arrives. So, as much as possible, take some quality time out with your partner, go on a babymoon, indulge in those pregnancy cravings and love your bump to the fullest. After all, there’s nothing wrong with some much-needed ‘me time’ every now and then! Welcome to 2018! What an exhilarating ride the last year has been. 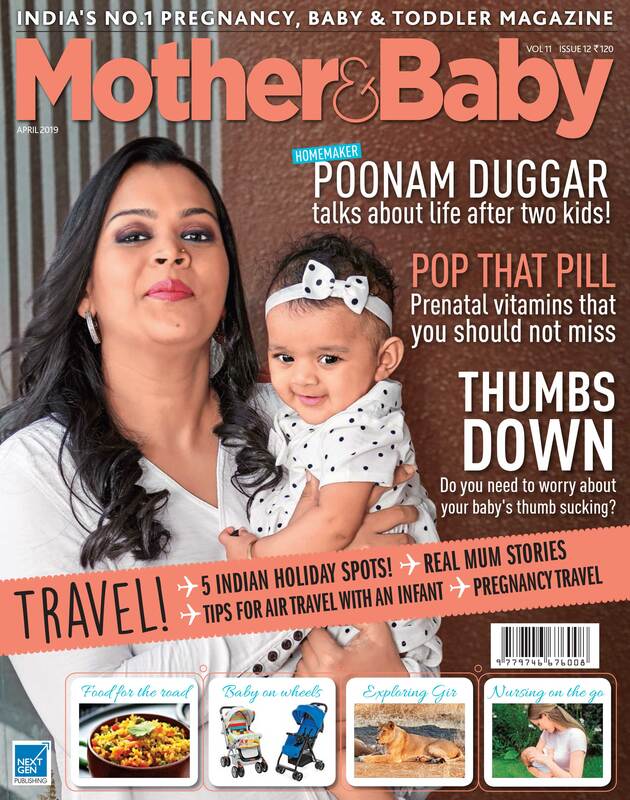 We gave ourselves a makeover and have brought you the best information to help you on your journey from pregnancy to parenthood. We’ve made sure to be with you every step of the way. This year, we only hope to do the same. Before I get into the details of what our very first issue of the New Year contains, I would like to thank each and every one of you for your continued support, feedback and appreciation. We wouldn’t really be here if it wasn’t for you, our loyal readers. 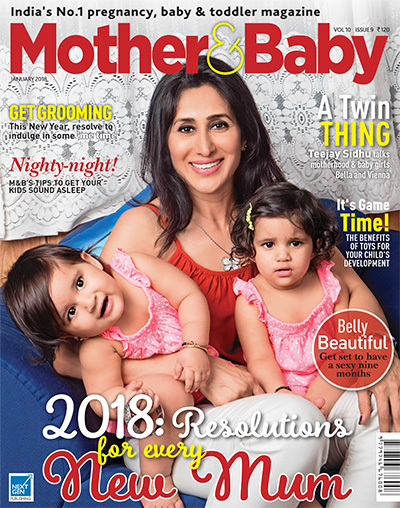 And this is exactly why, our January issue has all you need to help start the year on the right foot! From resolutions every new mum, especially a firsttime mum, must incorporate in her daily routine, grooming tips to keep you primed and ready, helping you fight those unfounded fears you may have, enabling you to give your children the best possible learning in the form of game play, to helping you make sure your child gets a good night’s sleep, we have everything you need! We also bring our our picks for what should be on your shopping list, some must-visit events and our top pics to make bath-time a whole new experience. We do hope you make the most of what we have in store this January. And as always, I do hope you enjoy this issue. Happy New Year! It’s the most wonderful time of the year once again. There’s a nip in the air and the Spirit of Christmas is all around us. By now, you may have guessed that December is my favourite month of the year. I mean, what’s not to love? The weather’s pleasant, we get to go shopping for new clothes and Christmas presents, but most of all, we have every right to let go and just indulge. After all, those resolutions to lose weight and get fit, must have a payout sometime, right? But on a more serious note, there’s nothing like a celebration to bring families closer. Our December issue reflects that. And while we encourage you to relax and take it easy, we also urge you to take care of everyday things that are easily looked over. Whether it’s choosing the right clothes for the season, making sure you get the right nourishment especially if you’re expecting, and giving you ways to make sure you’re a happy and contented mum, we have it all. 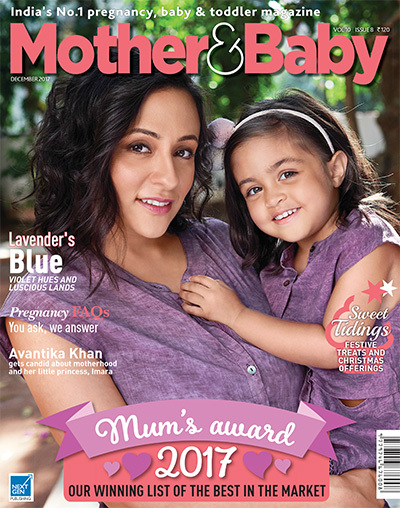 But, our December issue is a rather special one because we bring you our Mum’s Award 2017. Once again, we’ve taken special care to scrutinise the latest and best, the world or pregnancy and childcare has to offer. Read all about the process, and choose from the best to add to that Christmas shopping bag. We do hope you pick wisely! And, as always, we hope you have a very special, fun-filled Christmas! I’ll see you in the New Year.